Whether it’s to maximize space for a kick drum or to create a pumping that compels listeners to move, sidechaining is a common technique that lives somewhere between a mixing utility and a creative effect. Wherever our particular need falls on the spectrum between those uses, there’s one simple step we can add to the process that will shape sounds with cleaner and more musical envelopes - highpass filtering the input signal. The basic setup for kick drum sidechaining is pretty well known - crank Ratio, lower Threshold, then set the Attack as short as it will go and dial in a Release time that allows the compressor's gain reduction to recover just before the next hit strikes. Notice, though, the beginning of the kick remains strongly above the threshold for a sustained period. The compressor reacts to this by doing its job and keeping the gain reduction held out for that entire length, so we're not really getting the release-only envelope we asked for. Kick drums are largely built of two distinct parts - a subby low end paired with a sharp click in the high end. That thump in the subs is often louder and far more sustained than the click. These qualities of the kick sound will cause the compressor to clamp down for a long, uneven period before it can get around to starting the ideal, logarithmic release curve we're really after with this technique. What we really want is to get that release to work off the tempo/rhythm of the track, rather than the exact sound of the kick drum. Simple highpass filtering can isolate the snappy click in the top end of the kick, unlocking a precise trigger for launching smooth, logarithmic curve of gain reduction from the compressor’s Release. 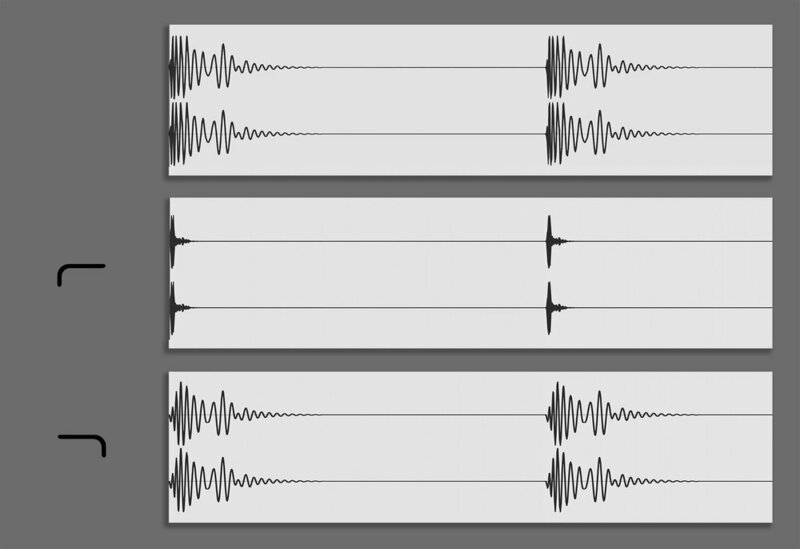 A kick sample (top) is broken into its component parts - a high-pass filter (middle) isolates the click (boosted for this image) and a low-pass shows the sustained bass portion of the sound (bottom). Many compressors have basic EQ tools for this kind of separation built right in. Live’s Compressor, for example, has an array of filters for incoming sidechained audio that will alter its makeup before it gets analyzed for gain reduction. Turn EQ on and dial in the appropriate Frequency and compensatory Gain (using the headphone button to monitor changes, if necessary) to improve its sidechainability. If the kick's click is properly isolated, this should produce a much cleaner, well-defined shape in the gain reduction envelope! The audible difference in these curves might ultimately be subtle, but depending on your sound and use, the result should be a bit more pleasing and musical. Getting there might not always require a high-pass - try sweeping through the frequencies of the triggering sound to find the range that will best impart its inverse into the groove of your track. For more complex sources, different frequency ranges may hold vastly different rhythmic material you can draw from. If sidechaining for mixing purposes (i.e. ensuring two low-end heavy sounds like a bass and kick don’t overlap), then you may want the gain reduction to be based entirely on the bass. In that case, leaving EQ alone or using a low-pass filter may be the best move. Or maybe that just means you'll want to look to at using a multiband compressor to independently separate and sidechain conflicting low end while maintaining the harmonics of each signal. When you’re after the creative effect of sharp pumping, there are many alternatives to guarantee a snappy, release-only envelope without the need for filtering. For example, you could create an additional, muted track with looping short clicks on each quarter note and feed that into your compressor in place of a kick. You could also use a dedicated effect processor to create sync’d gain envelopes to your exact specifications. The Max for Live Shaper is one particularly useful tool for these tasks, or if you prefer immediacy over flexibility, check out our own pump+ device. Hopefully this technique gets you thinking about your routing in more nuanced and purposeful ways. If you want to dig a little deeper on compressor topics in general, be sure to have a look at our animated guide on the basics. Let me know on Twitter what kind of subjects you’d like to see next in the Workflow Snapshots series!